Trying to write a review of OS X Mountain Lion is tricky. First of all, I had already written a review back in February, when Apple legitimately surprised the world with the revelation that the ninth iteration of OS X was just about ready to go. Granted, back then I only had a few days to play with an early build. But it was already pretty solid at that point. Now, months later, I’ve had a lot of time to play with Mountain Lion, and I’m happy to report that it’s even more solid. But ending my review there wouldn’t do Mountain Lion the justice it deserves. It’s definitely the most polished and robust version of OS X yet. If you liked Lion, you’ll love Mountain Lion. If you didn’t like Lion, you’ll probably love Mountain Lion even more because it seems to fix a lot of the performance/quirkiness issues that some folks were having with the last version of OS X.
I didn’t have any of those issues with Lion, so as someone who had started using an iOS device far more than a Mac, I liked Lion right from the start because it borrowed a lot of little ideas from iOS. And Mountain Lion expands upon that practice. So, unsurprisingly, I like it even more. 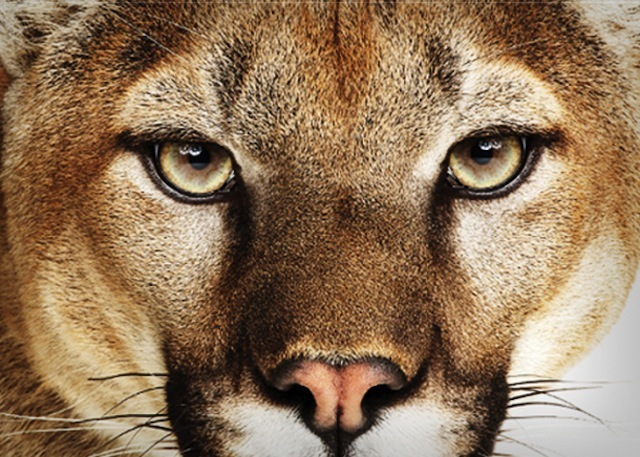 It must be said that Mountain Lion isn’t really all that different from Lion — hence, the variation of the name (even though mountain lions are technically cougars — insert joke here). But unlike the jump from Leopard to Snow Leopard, which focused on performance and tightening code rather than features, the jump from Lion to Mountain Lion does pack some new goodies. Apple has already highlighted what they view to be the 10 key features of Mountain Lion, both in the original previews and at WWDC last month. I won’t spend time giving an overview of each of them again — if you’d like that, go here. Instead, I thought I’d talk a bit about my experience using Mountain Lion over these past several months. And point out the things I like the best, and a few things that I don’t like. Initially, I just had Mountain Lion installed on the review machine that Apple loaned me back in February. 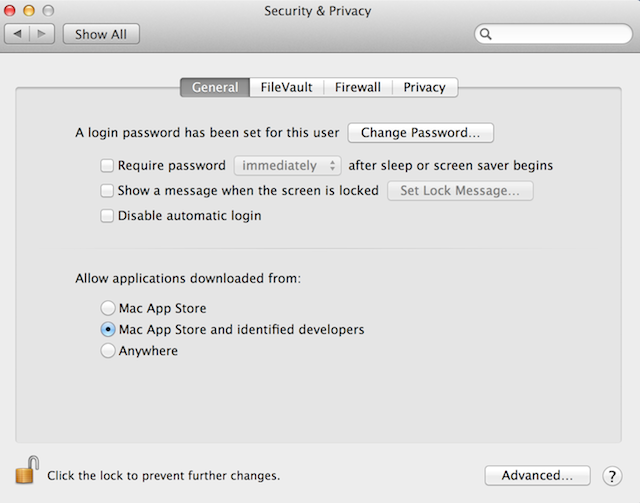 But as Mountain Lion quickly became more stable, I decided to install a developer build on one of my personal Macs as well. On a mid-2011 MacBook Air, there were no noticeable performance gains (nor is Apple touting any), but the machine did seem to wake up much quicker from sleep. More recently, when I installed Mountain Lion on my 2009 iMac, I did notice that my machine started up (and shut down) significantly faster, which was nice. Overall, that older machine has had no issues with Mountain Lion (though there are limits as to just how old a machine can be and still run the new OS). App compatibility has been surprisingly good. I actually haven’t found any with major problems due to the upgrade from Lion to Mountain Lion. I’m sure there are some out there, but even apps that pushed out Mountain Lion-ready updates a little early seemed to work fine without the updates (the updates just added things such as Notification Center capabilities). Notifications are the most in-your-face and probably best new feature of Mountain Lion. We’re all used to dozens of apps on our machines alerting us to something. Now the process is streamlined in a very iOS-like manner. While there aren’t too many third-party apps out there that support these new notifications yet, Apple’s built-in apps alone make this a most-welcome addition. 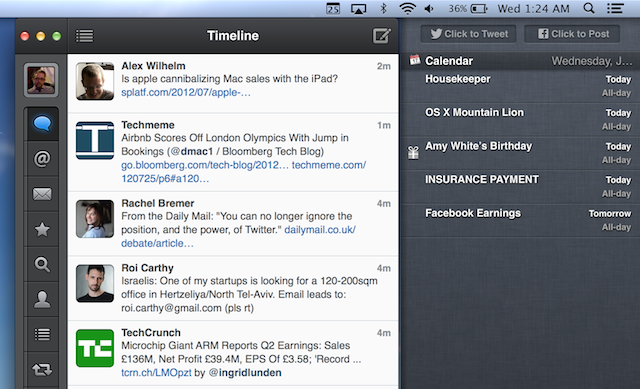 Those built-in apps now include Twitter in Mountain Lion. If you sign in (from the settings) with your Twitter account, you can now get notifications every time someone @replies you or DMs you. It’s fantastic. And while there is a button that enables you to tweet right from the notification area on the right side of the screen, when you reply to Twitter notifications, unfortunately you’re dumped into the web app (who knows what Twitter is doing with Twitter for Mac, which still has the old Twitter logo and non-Retina graphics). Also built-in will be Facebook. Oddly though, this feature won’t go live until the fall (with an update to Mountain Lion). Apple gave me a build with Facebook enabled, and it seems to work well. You can post with the click of a button just as you can with Twitter — and it works with Facebook’s more granular sharing settings (share with just your family group, for example). I assume Apple wants to give developers a little more time to work with this Facebook integration, as many of them will want to use it for things like Single Sign On for apps, and sharing. The fact that Chrome and Safari work with Notification Center is great news for web apps. I’ve been able to get alerts when I have a new Gmail message, for example. Chrome has had a similar banner system for some time, but the native OS X notification experience easily blows it away. Another feature that users are likely to notice pretty quickly is Gatekeeper. That’s a bit odd since it’s not really meant to be a forward-facing feature, but rather it’s meant to be more of a protection layer. But since the default setting is to block unsigned apps from the web, people are likely to hit it right away (since most developers won’t be properly signed at the launch of the OS). Don’t panic. This doesn’t mean you can’t install all of your favorite apps via the web with Mountain Lion, it just means that you’ll have to go into settings and hit a button to allow for unsigned app installs. I suspect we’ll see a little backlash against this early on simply because there won’t be a lot of developers signed up just yet. (And I can’t wait to watch parents try to figure out how to change the default settings.) I’m told some bigger ones, like Adobe, are already on board. But there are thousands upon thousands of developers out there that will want to get the certification (which only requires a $99/year developer account — there’s no vetting at first, it’s an honor system until you do something wrong). It may take a little time. Another new feature that I’ve run into time and time again in Mountain Lion is Documents in the Cloud. Because iCloud is now fully baked into the OS, you’ll find this feature as a part of everything from TextEdit to Preview. This also may be a bit jarring at first because it’s really blowing up the traditional notion of a file system, at least from a conceptual perspective. Rather than files residing in folders on some drive that you access through Finder, files are now simply documents within the apps themselves. That probably sounds more confusing that it is. It actually makes a lot more sense to do things this way — and again, it’s something borrowed from iOS. When you open a document-based app in Mountain Lion, you’ll be asked to pick which document you wish to open from a list of documents specifically tied to that app. If you want to open an outside document, you still can, but it’s a step away now into the folder system. Then there are the apps that have been ported over from iOS: Reminders, Notes, and Messages. Each is great provided you’re also an iOS (and by extension, iCloud) user, otherwise they may seem weak. Messages was released in beta form late last year as a replacement for iChat. It’s probably good that Apple did this because it was very wonky at first. In Mountain Lion, it seems much more stable. More importantly, messages delivery seems to actually work all the time now no matter which device you’re using. 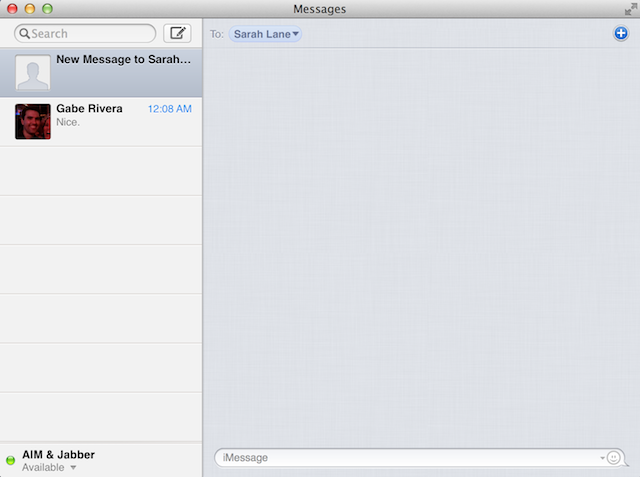 But for people who were used to iChat, with its more traditional IM ways, Messages will probably seem a bit odd. Even now, the iMessage/IM duality is sort of strange — am I supposed to close/delete messages after I’m done with “chat session”? Another killer new feature of Mountain Lion that I find myself using quite a bit is AirPlay. iOS users will know this well, and they should be thrilled to have this for the Mac now. A couple weeks ago, there was a sporting event that was being streamed live on the web, but wasn’t available on the iPhone/iPad. With Mountain Lion, I simply opened a browser window, hit one button, and my entire desktop was sent to my TV via my Apple TV. I put the video fullscreen and you couldn’t even tell we were routing this, wirelessly, through a computer. Magic. One feature I’m still not completely sold on yet is Safari. Apple’s web browser has been around for years now, and each year, Apple seems to claim it’s the fastest out there. The problem is that there are so many tests now tailored to different things, that it’s hard to know what matters. All I know is that in daily usage, Chrome still feels faster to me, so that’s what I use. But Apple has once again overhauled Safari to make it competitive with Mountain Lion. A couple key features rely on iCloud: iCloud Tabs and Reading List. It’s definitely nice to see what tabs you have open on other Apple devices, but Reading List feels less compelling in a world of Instapaper and Pocket. The biggest change you’ll find in Safari is the addition of a “Smart Search” bar — or an “omnibar”, to use Google’s parlance. That is, a unified top text bar that smartly handles both URLs and searches. Chrome has had this feature for a while, and it’s a welcome addition to Safari (though, oddly, it’s not a part of Mobile Safari). Also new is the Safari Tab View. This allows you to zoom out of any page and get a quick look at the tabs you currently have open. It’s a nice effect, but it’s simply not that practical. 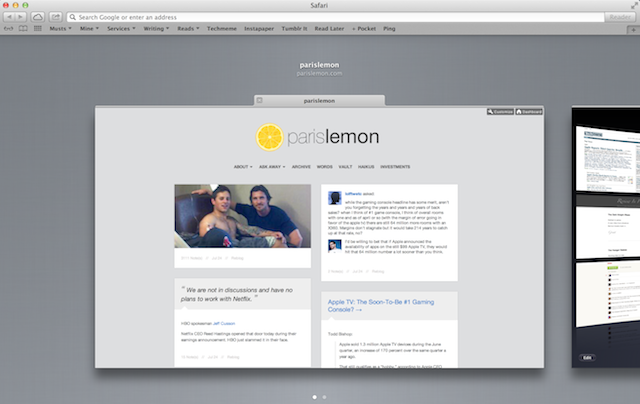 I’d much rather see Safari add something like pinned tabs, to make the tab situation more manageable. While I said that performance gains weren’t a concentrated focus for Mountain Lion, one area the OS X team did work on is smooth scrolling and hardware acceleration within Safari. The work shows. Overall, Mountain Lion feels like the most natural step yet towards the convergence of iOS and OS X. While Apple says there are now over 66 million OS X users, Apple sold nearly 50 million iOS devices just last quarter. It’s clear that OS X has to continue to creep closer to iOS simply because that’s what far more people know now. It’s hard to imagine how Apple will further refine OS X from here. Maybe they don’t — maybe OS XI (OS 11?) is next. Or maybe Apple has one more big cat left in the bag (in terms of nicknames, there really only are a couple left). For now, Mountain Lion will stand atop the mountain. It’s solid, polished, and perhaps most importantly, cheap. For $19.99 in the Mac App Store, you’ll be able to upgrade all your machines to Mountain Lion. You can upgrade both Lion machines and Snow Leopard machines, and they both cost the same price, which is great. The upgrade is an absolute no-brainer. In a time when Microsoft is just about to upend their entire OS with their biggest change (and bet) yet in Windows 8, Apple has taken a much more refined approach. Perhaps they take some criticism for this, or perhaps they’re just being savvy. OS X remains a great OS. And sprinkled with some of the best elements of iOS, it still feels pretty fresh. Not bad for an eleven-year-old big cat.